Playing retro games or remakes on a current-gen console can be a saddening experience. Games like Mario 64 or Guardian Heroes just don’t feel right without the controllers they were designed for. 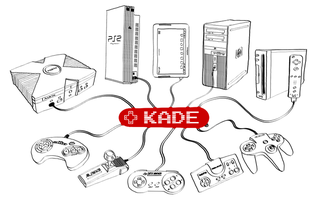 KADE aims to remedy that with a single box, but can they? If the miniConsole+ works as intended, it could hit a real sweet spot for gamers looking for retro gaming fix. I, for one, have some old Dreamcast fight pads I’d love to use on my Xbox or PC. The developers believe they’ve crafted a lag-free experience with the miniConsole+, though they’ve admitted more formal testing will need to be done later. As for the device itself, it’s a small, black metal box with one end containing a USB output cable and the other a 19-pin connector. The device—depending on which option you purchase—will include a number of specially-made cables for connecting your controllers of choice to the miniConsole+. As well as the miniConsole+ itself, KADE is also offering expansion boards that will allow the miniConsole+ to connect to older consoles like the Genesis, NeoGeo and SNES. If for some reason you’ve always wanted to play Super Mario World with an Xbox controller, you can do that, too, I guess. For the tinkerers out there, KADE also offers a maker’s kit version of the miniConsole+, for those interested in integrating it into an arcade cabinet or similar configuration. As with any Kickstarter, remember that there’s no guarantee this item will ever materialize. As of this writing, the miniConsole+ is sitting at about twice its goal. KADE is working on getting us a review unit, so expect impressions as soon as we get our hands on it. If you’d like to support the miniConsole+ on Kickstarter, you can do so here.